AllSpec Finishing works with a variety of quality plating vendors to offer a variety of commercial plating applications to a wide range of industries. The Company is well known for its superior workmanship and fast turn around times regardless of the size of the plating batch. AllSpec Finishing offers metal plating services which can utilize nickel, silver, copper, and tin. The many industries we service includes metal plating for the medical, electrical, and military industries to name a few. There are many reasons for using electroplating just as there are many metals to plate with. One reason is that it makes the plated part last decades longer than unplated parts . A plated part gets protection from wear as well as from rust and corrosion. 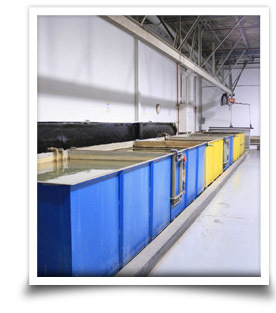 Another reason for choosing electroplating is the asthetic aspect. Proven process-control inspections ensure the high level of quality AllSpec Finishing consistently delivers on their electroplating process. Click here to get a free, no obligation online quote from All Spec Finishing. Allspec Finishing has been integral to our Supply Chain for many years for MIL-SPEC Paint requirements as well as other types of Coatings. They are extremely reliable in regards to conformance to various specifications and drawing interpretation. Their On-Time Delivery performance and ability for Fast Turnaround is exceptional. Allspec Finishing has for several years provided our company with exceptional quality, quick turn around, and competitive pricing. They are very reliable and their staff is very professional and a pleasure to work with. We're excited to partner up with your company on your next finishing project. Regardless of the size of the job or the complexity, we have the industry experience and knowledge to get your job done on time and on budget. Copyright 2019 - AllSpec Finishing Corp. Binghamton NY.